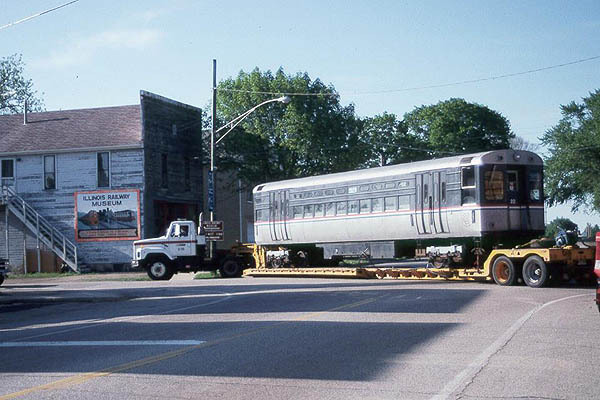 When the 1-50 series cars were originally sold off, several went to museums, including cars 30 and 41 to the Illinois Railway Museum. Several were also sold to David Harrison for use at a proposed train museum, but after that plan fell through new buyers were needed for his cars. One (car 35) went to East Troy, while another (car 33) will likely be scrapped. But a third - car 22 - also needed a new home. So, the Illinois Railway Museum stepped forward to take a third car and save it from the scrapper. Car 22 was built in 1959 by the St. Louis Car Company. A 1-50 series car, number 22 is an all-electric PCC car, the single-unit cousin of the near-identical 6000-series cars. Never equipped with trolley poles, car 22 spent its life on third rail lines such as the West-Northwest Route, the Ravenswood Route, and the Evanston Route (after its conversion to third rail in 1973). The 1-50s were uniquely suited to the one-man operation that often came with the Evanston Shuttle, with two motor cabs in each car, a fare collection window and door controls in the motorman's cab, doorsets placed nearer to the car ends. In 1985, cars 5-50 were sent to Morrison-Knudsen for a mid-life rehabilitation. 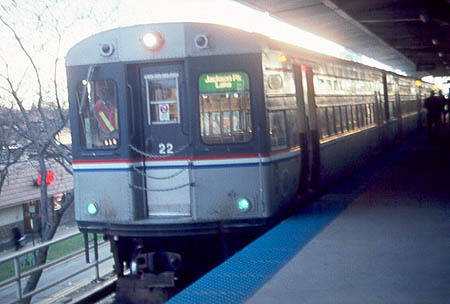 Car 22 continued in Evanston service until its retirement from passenger service in 1993. It then became a work car, but had minimal alterations made. Car 22 required a good deal of work. Several windows had to be replaced, the interior required extensive cleaning after vandals covered the seats and walls with fire extinguisher powder, a motor had to be replaced due to mechanical failure, and additional trackage had to be built to hold the car. All of this work cost approximately $4,000, but $1,000 worth of costs still need to be met to pay for the car's rescue and rehabilitation. Car 22 was tested after the #2 motor was replaced and was placed in service for one trip on Saturday July 22, 2000. The car was jumpered to car 41, which acted as the trolley host. All donations are tax deductible. For more information about the museum and its restoration efforts, check out the museum web site.